Michael Mann's Collateral (2004) ends exactly where Heat (1995), an earlier masterpiece, begins. It's with the image of a Los Angeles subway train pulling into a station. 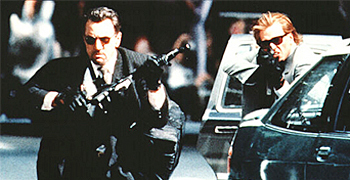 In fact, as we learn on the two-disc "Special Edition" Warner release of Heat (which replaces an earlier bare-bones disc released in 1999), Mann used the very same location for the last sequence in Collateral, the only difference being that when Mann shot Heat in 1994, the Los Angeles subway system was not yet up and running. 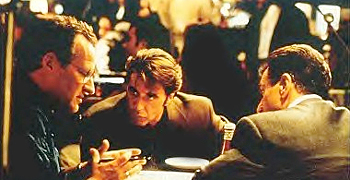 When Heat came out in December 1995, the film generated its own immediate form of media heat, mostly because it was the first movie in which Al Pacino and Robert De Niro had scenes together. They were both in The Godfather, Part II, of course, but appeared in different storylines. But then almost immediately there was a palpable moviegoing detumescence when audiences learned that basically Pacino and De Niro only had one scene together, facing off quietly in a diner over a cup of coffee and talking in low tones. And that Mann shot the scene in a series of over-the-shoulder two shots in which the two "greatest actors of their generation" rarely occupied the same frame with dramatizing profiles. It's as if Mann perversely wanted to thwart the audience's expectations. Or, as some speculated, maybe Pacino and De Niro were feuding and wouldn't appear on the set together (not true: they really are acting across from each other, as supplemental footage, and the film itself, for that matter, prove). Still, it remains a good, well-written confrontation scene that pulls together the moral reverse "mirroring" theme Mann has set up between cops versus crooks, and we all can now appreciate as the well-acted double that it is. Sure, Pacino and De Niro are great in it. But the new DVD release offers a wonderful occasion to reassess. Today, the still-sympathetic viewer can see that Pacino tends to overact in some of his scenes (at a time when his voice was starting to develop a shredded, swallowed tone). Intentional or not, and occasionally hilarious, such moments contribute to Pacino's scenery-chewing rep. Meanwhile, De Niro, whom everyone was mad at throughout the 1980s thanks to a run of dogs, remains fiercely inward, stoic and commanding, except for one brief moment when his character pauses to reflect at a crucial moment (Mann points it out on the commentary track). And sure, everybody talks about De Niro and Pacino  but what about De Niro and Jon Voight? There was a time when Jon Voight was deemed a natural successor to James Dean and other hot screen youngsters. But Voight didn't exude the wily sexuality of a Dean or Newman or Beatty and so went on to become perhaps the premier character actor of his time. Here, Voight and De Niro have three scenes together that are as brilliant in their subtlety and modulation as the scene with Pacino. Acting aficionados should get just as high on those moments. Or how about De Niro and Ashley Judd? She is stunning in a brief if powerful role. Their one scene together is exceptional, and Judd proved with it that, even early in her career, she had the chops to size up against the greats. But dig the rest of the film's brilliant cast. We've got Val Kilmer as Judd's husband, Chris Shiherlis. We've got Tom Sizemore as fellow crew member Michael Cheritto. We've got Diane Venora, Pacino's then-girlfriend, as his wife, and Natalie Portman as his stepdaughter. We've got Amy Brenneman as the young woman who diverts De Niro's character from his rigid discipline. And that's just the top layer. In addition, there is a host of great character actors with fantastic faces, including Wes Studi, Ted Levine, and Danny Trejo. There are numerous great African-American performers in key roles, including Dennis Haysbert, Mykelti Williamson, comic Ricky Harris, and musician Tone Loc. And we get early glimpses of future heavyweights such as William Fichtner and Hank Azaria and Jeremy Piven. Mann regulars Martin Ferrero, Xander Berkeley, and Tom Noonan also appear in small but crucial moments, and there is the novelty casting of Henry Rollins. Even Bud Cort pops up, as Solenko, the corrupt restaurant owner. As a side novelty, the film features two actors who played serial killers in Hannibal Lector movies. But almost against the picture's will, De Niro's Neil McCauley is the heart of Heat. He's a machine, a professional thief unlike any likely to be seen in a film. Through dialogue and asides the viewer is clued into McCauley's backstory, the source of his professionalism, and the weakening of his harsh façade. It makes us want McCauley to live. But he can't. And the reason he can't has nothing to do with the traditional roles of good guys versus bad guys in movies, with their pre-ordained outcomes. It has to do with how embedded Heat and its subject matter are in Mann's past. In fact, as is now well known, Mann did a rough draft, TV movie version of Heat, then called L. A. Takedown, which aired on ABC in 1989. This rough draft uses many of the same situations and some of the same dialogue (even spoken with similar cadences: compare both Xander Berkeley and Kevin Gage as Waingro saying, "That is why I am here"), but it is not as thoroughly thought out, or highly budgeted, as the more successful Heat. The roots of the film go back to Mann's early days in film. Mann, raised in Chicago, was immersed in crime stories of the time, and he later became friendly with cops such as Chuck Adamson and Dennis Farina, who told him stories behind the headlines he read as a kid. One of the stories Adamson told was of a thief named Neil McCauley whom he tracked for some time. He once had coffee with him (the source for the film's famous scene), and later gunned him down after McCauley's crew was caught robbing a grocery store on payroll day. This happened in 1964, and Mann has been brooding on this material ever since, throughout all his years as a film student in swinging London, as a documentarian, as a writer for "Starsky and Hutch" and other TV programs, and during Mann's own burgeoning film career. Thirty years after Adamson killed him, McCauley came to the big screen, and under his real name. But Mann draws an important distinction between Neil and his nemesis, Pacino's Vincent Hanna. As much as Mann, and Adamson before him, secretly respected McCauley, he is still a sociopath. Hanna, for all his arrogance and marital troubles, is the man who cares about others, who works for the public good. At heart, Mann, like his fellow Chicagoan Andrew Davis, is a moralist, and his grand designs, like Davis's, are embedded within very realistic, documentary style surfaces that never forget that they are grounded in morality tales. Heat is enjoying its 10th anniversary, and Warner Home Video, which initially released a truncated version of the film before re-releasing it in its current 172 minute version, first the big screen and then on DVD, is now behind the title by publishing an expansive two-disc set. It's not clear if this anamorphic transfer (2.35:1) is new. It looks about the same as the previous DVD iteration, which was a tad on the soft side. However, the Dolby Digital 5.1 audio continues to show Mann's strong suit, with the famous heist sequence, with M-16s blasting like firecrackers in our ears, especially strong. Aside from three trailers, the primary extra on the first disc is the audio commentary track by Mann. Speaking calmly through his thick Chicago accent, Mann does something unusual, which is to concentrate on meaning, motivation, and character rather than location hassles and happy-time collaboration anecdotes. Mann is intent upon exploring Neil and Vincent's characters again in this track. Which isn't to say that the track is bereft of facts. 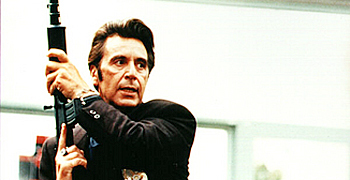 One of the tidbits the auditor learns is that Voight's character was made up to look like the scab-faced Edward Bunker, the famed crook turned author whose book No Beast So Fierce was adapted by Dustin Hoffman as Straight Time (Mann worked for a time on the script) and who also appeared in Reservoir Dogs, among some 20 other films. "Season's Starting Early" (00:32) shows Cheritto buying hockey masks, a scene that obviously falls among the shots of McCauley stealing an ambulance and Shiherlis buying explosives. "Nicest Guy on the Block" (00:39) finds Cheritto arriving back at his domestic hearth, playing with his kids, giving his wife a packet of money, and then looking mysteriously dazed. "Albert and Hanna" is an alternate take of Hanna's famous dialogue with a snitch (00:18), which may be only the second time Pacino has ever sung on screen. "Shakedown" (00:27) finds Hanna and Sergeant Drucker rattling the cages by pressing a shady TV repairman. "Murder in C Block" expands the dialogue between Pacino and Tone Loc, with the effect of illustrating Cheritto's ruthlessness, even behind bars (00:34). "Let's Dance" (00:45) expands a scene in a restaurant between Hanna and his wife, dancing and talking about how they got married in the first place. "Late Arrival" (00:38) is an expansive of McCauley's crew discussing how they got made, with Cheritto arriving late, showing the transponders used to monitor his car, and making a guess as to how the cops got on to them (dialogue elsewhere in the movie confirms the suspicion voiced in this deleted bit). "Where's Ana?" is probably the key addition. At 02:19, it reveals that Trejo has been blackmailed into betraying Neil, am illuminating scene that readers have found only in the Heat script, available online. "Double the Worst Trouble" is an addition to the scene between Neil and the shady doctor, who tries to squeeze him for a bigger fee (00:41). "Nate Delivers" (01:12) is another newly informative scene between De Niro and Voight (it explains where Neil would have gone and how if he'd got away). Finally, "No Response" (00:18) is an extraneous shot of De Niro getting into a car into a catatonic Brennamen. The "making-of" material on the second disc come in five parts, three of them comprising one element. 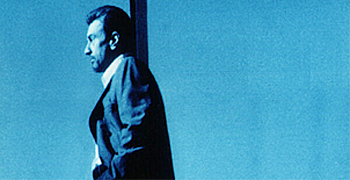 "The Making of Heat" is the overall title for three mini films, "True Crime," which gives the background of Mann's interest in the material behind the film, "Crime Stories," which explains how the film was made, and "In the Fire," in which Mann and the cast explore the moral implications of the film (Diane Venora, for example, complains that in her research into the lives of women who are married to cops, she was disturbed to find out how excluded they are from that masculine world). "Pacino and De Niro: The Conversation" focuses quite obviously on the famous diner conversation, while "Return to the Scene of the Crime" follows Janice Polley, the film's location manager, and associate producer Gusmano Cesaretti, as they revisit several of the 65 locations, scattered as far a field as Terminal Island and east L.A. The influence of Heat continues. Wes Anderson quoted it in Rushmore, as did Christopher McQuarrie in Way of the Gun. In 2002 Mann started up a new TV series called "Robbery Homicide Division," a short-lived crime drama unofficially based on the same characters, with Sizemore in the Pacino role. And to look at David Caruso in "CSI: Miami" is to see a man adopting the mannerisms that Al Pacino used to such great effect in Heat. But the influence of Heat radiates much deeper than that. It has worked its way into the very marrow of many of its fascinated viewers, as evidenced by the paeans to the film from writers as diverse as James Wolcott, who dedicated one of his month Vanity Fair columns to the film, and Sight and Sound editor Nick James, who contributed a monograph on Heat to the BFI Modern Classics series.